Well, the new film isn’t finished yet. I’m here to revive this old blog with updates on the process of my NEXT film. Here I am, at my desk, sitting with the early stages of the follow-up to Little Theatres: Homage to the Mineral of Cabbage. It’s called Invisible Harvests. in 3- or 4-dimensional chart. This was taken off the top of the (now) stack of sticky notes. These were written a year ago and I admit I’m not exactly sure what this one means anymore. But it was all absorbed somehow and processed and has come back out in the form of a script, which I can now hold in my hands. Over the next couple of months, I’ll be building new sets, and designing and creating new puppets, and showing here how it all unfolds. I’d like to start with the sets this time; I think for the last film I started with puppets. But the sets in this film are central to the story. The “story,” by the way, is not as much a story as it is a visual poem. It loops around without narrative, although it is structured by Chapters. 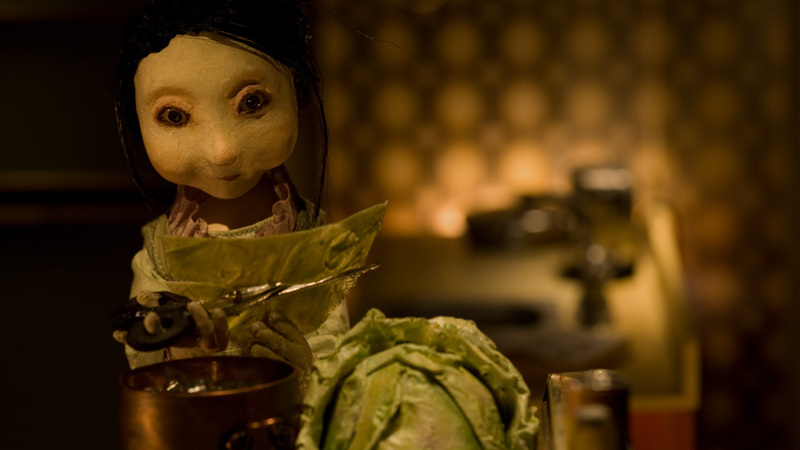 The theme of the film is fermentation, though the word “fermentation” doesn’t appear anywhere in the script. It’s also about time, death, renewal, cycles, nature, optics, farming, cooking, alchemy, and healing. I’ll be updating this blog, and instagram page, with my progress as I go. I’m hoping to finish the film in the next 12 months, which may be ambitious for a six minute (or so) film that I’m working on pretty much by myself. We’ll see! Invisible Harvests will eventually have its own associated website about fermentation, here. This entry was posted in Invisible Harvests on June 3, 2016 by stephanie dudley. let the record show, at 2:04 pm on Friday, August 13th, 2010, I SHOT THE LAST FRAME!!! So I am dropping in here today, one year after shooting the last frame, to make the exciting announcement that was hinted at in the last post… Little Theatres: Homage to the Mineral of Cabbage has been accepted into TIFF! In my very own hometown, the film will be screening at an international festival. So this past week has been a whirlwind of excitement, including a press conference, the TIFF BootCamp (an entire day of seminars and chats with organizers of TIFF, as well as filmworld professionals: seasoned TIFF director Ingrid Veninger, a publicist, a journalist from The Toronto Star, distributors, etc. ), and meeting other directors who are also screening at the festival. The screenings will be on Wednesday September 14th at 5:30pm, and Thursday September 15th at 1:00pm. 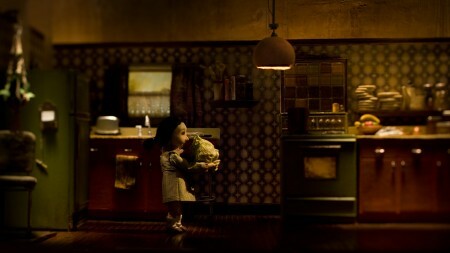 There are 43 short films in the festival, that are part of the Short Cuts Canada Programme, curated (is this the word?) by TIFF Programmers Alex Rogalski and Magali Simard. The films will be divided into 6 screenings, with Little Theatres appearing as part of Programme 6. I’m so proud and honoured to be part of this festival! It’s like waiting for school to start, only my whole school year will be condensed into the first two weeks of September. Can’t wait. This entry was posted in Film Festivals on August 13, 2011 by stephanie dudley. I’ve had a draft of my Annecy Report here half-written for ages… I’m very sorry for being so slow! It’s just been a beautiful summer here, and have been spending time away from the computer. But I wanted to write quickly, for anyone who would like to apply, that there is a fairly new stop motion festival in Montreal that sounds great. I am applying for it, and hope to see / meet some of you there as well! Montreal is a fantastic city… I can’t wait to go back. Assuming the film gets in… you never know. Well, either way, I will visit soon. I have other exciting news, but can’t announce it yet, so that’s all I can say for now! Which is not much. Oh, and the film has been accepted into KROK, the Ukrainian Animation festival that takes place on a boat, while travelling the Black Sea. I’m looking forward to that! Edit: The list of films is quite different from those screened at Annecy… which is EXCITING!!! I wonder what the film “Modern Spleen” will be like?… What an intriguing title! 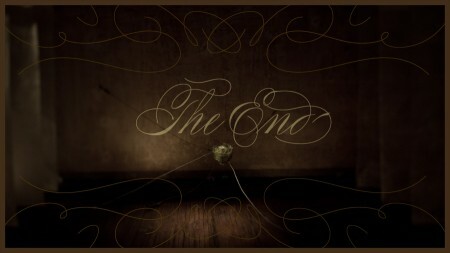 That’s all for now… maybe we will have a rainy day here soon so that I can finish my Annecy post. This entry was posted in Film Festivals on July 15, 2011 by stephanie dudley. Premieres: Annecy Animation Festival, June 2011. The trailer is ready for Little Theatres — enjoy! Also, in 5 days I will be in Annecy, at the Animation Festival… I’ll keep this blog updates with everything that goes on, as best as I can. AND! At 10pm ET, 7pm PT next week, June 8th, there will be clips of the film shown on Bravo!, on a new show called In Short. Check it out! 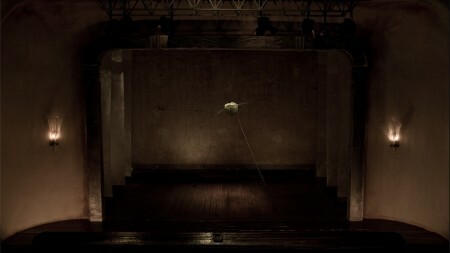 This entry was posted in Film Festivals on May 30, 2011 by stephanie dudley. So, the festival applications have been coming along well. I’ve sent off the final film on HDCams, in both English and French, to Annecy. And have just sent off an application to a festival in Ukraine! 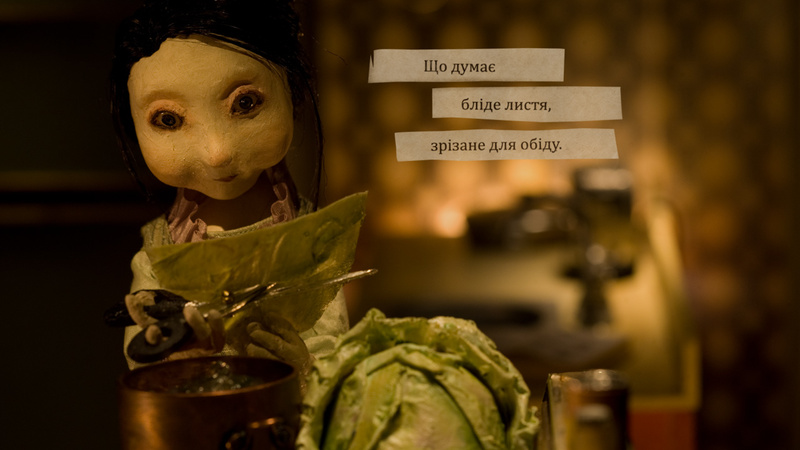 To apply, I sent a version of the film with Ukrainian text, translated by a friend of Erín Moure’s, Albina, who lives in Ukraine. She had already translated Erín’s poems (the entire Homages to Water series from Little Theatres), and was kind enough to translate the credits of the film into Ukrainian, too. 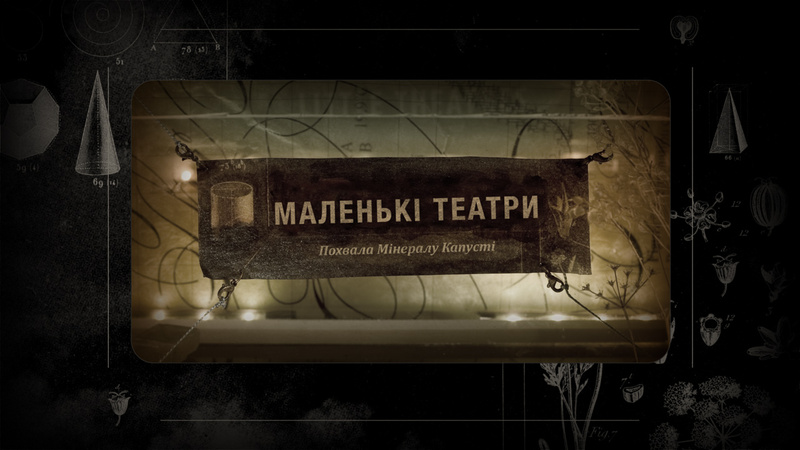 It’s so exciting to see the film in cyrillic letters! I guess cabbages seem well suited to this language. And the festival sounds so exciting… it takes place on a boat, travelling the Black Sea from Kyiv to Odessa. 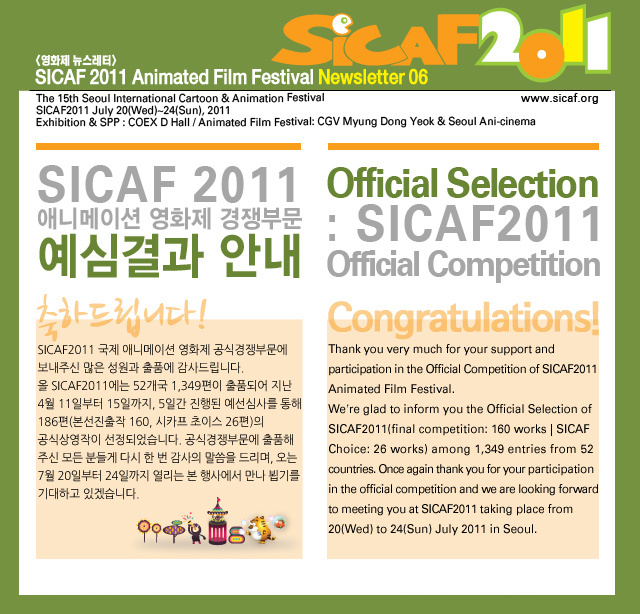 I’ve also just heard that the film has been accepted to SICAF in Seoul, South Korea! This entry was posted in Film Festivals on April 28, 2011 by stephanie dudley. My little film made it in to the official selection at Annecy Animation Festival! I’ll be going to the South of France — it is a dream come true. Thank you, Annecy judges! I can’t wait to experience the festival and see all the amazing work out there from around the world. This entry was posted in Film Festivals on March 12, 2011 by stephanie dudley. First a quick update. I’ve been sending out screening DVDs and filling out forms for the film festivals, focusing for now on either Animation festivals or Short Film Fests. So far I’ve applied to Annecy, SICAF, and Anima Mundi. More applications to come… I have a spreadsheet of about 50 of them, sorted by application due-dates, and I’m just sending out packages one at a time. My absolute hope is to have the film premiere at Annecy… For now it is just a dream. In a few weeks I’ll find out whether or not the film has been accepted. The other day I met up with someone I used to work with at the very beginning of my freelance motion design career… the very talented Yoho Hang Yue, who now works at Crush here in the city. He would like to start working on a stop motion experiment, and has some really beautiful characters designed, which he would like to turn into animatable puppets. I was going to email him this info, but maybe it will be useful to other people too? So here it is. Plumbers’ Epoxy Putty. This stuff is available at pretty much any hardware store, and some art supply stores, including Aboveground (my favourite place for general sculpture supplies, but I will get to that later.) It’s a horribly stinky and toxic stuff that I try to use sparingly, but it is also handy for quick fixes, for making solid joints or ‘bones’ in a puppet’s armature, or holding together anything that glue won’t hold. It’s a putty, so it will hold things in place while the epoxy sets (unlike glue or liquid epoxy), and cures fairly quickly… like in about 15 minutes. Like all epoxies it comes in 2 parts — it is a compound of two materials that need to be kneaded together before the hardening chemicals are activated. Plumbers’ epoxy is the sort of inelegant version of sculptor’s epoxy putty, in that there is no time for refining, and it is quite globby to work with. So it won’t be able to be placed in any sort of specific shape. It’s a quick way to fasten objects, but not meant to be sculpted or refined too much. However, there’s a slower-setting, less stinky, and more sculptable epoxy putty that is also quite handy for different modeling needs. (And is also meant to be used to hold hard-to-glue objects together…) One make is Apoxie Sculpt, available at Sculpture Supply Canada. The other is a Welsh product called Milliput, which I found at Wheels and Wings hobby shop in the East end. I have more experience using Milliput than Apoxie… it was really easy to work with, though it does take a while (12 hrs?) to cure. The advantage is, along with the slow curing time, you can use water to refine and smooth the shape, like with clay. It hardens to a sandable, paintable, hard finish. For my puppets’ armatures, I used an aluminum armature wire, available at Aboveground or (in larger quantities) at Sculpture Supply Canada. There is lots of info out there on wire armatures, but general rule of thumb is that it’s better to have thinner (1/8 inch or less) wires wound together in layers of 2 or 3, rather than one heavy (1/4 inch) wire. While the glue dries (I only use Weldbond, by the way) he can keep the pieces held in place with masking tape. Alternatively, there are liquid epoxies that he can use to create a base for the puppet… Though again these are very stinky and toxic… But I have used the quicker-drying LePage epoxies, available at any hardware store, or, again, at Aboveground. I usually used the 15-minute one. They come in a tube containing the two substances, that are sort of a gel-consistency… with a plunger, that when you press it, it dispenses the two gels in (supposedly) equal quantity. Then you mix them to activate the epoxy hardeners. Here is some more info on epoxies. That site, This to That, is also a fun way to figure out how to stick things together. 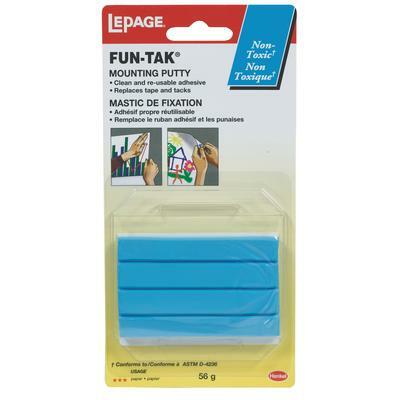 Fun-tak — used to stick things together temporarily, like when a puppet is holding something in its hand that needs to move or be removed. It only comes in blue, from what I’ve found, so sometimes there can be gobs of blue stuff that you need to paint out, if you’re not careful. But when used in small, discreet pieces, it can be extremely useful. It’s available at hardware and art supply stores. I used many other materials for my puppets, which won’t really be helpful to Yoho, but perhaps if anyone else needs to make a more traditional-looking puppet, the materials and techniques are talked about over their various stages here. I used things like liquid latex, liquid 2-part foams, plaster for moldmaking, and sculpting clay for modeling the puppets, mostly from Sculpture Supply Canada. For LED lights and other specialty miniature-type things I went to The Little Dollhouse Store and George’s Trains. Both stores are in the same neighbourhood. All my LED light strips came from the Dollhouse place. Other tiny incandescent bulbs that were used for the practical lights came from George’s. I’ll also make a links bar at the side with these stores, for reference. 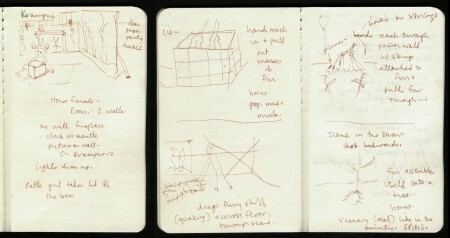 This entry was posted in Film Festivals, Tools & Materials on February 18, 2011 by stephanie dudley. Important Note: The film above is uploaded in HD, so you MUST see it scaled up to fullscreen mode! Click the arrows on the bottom right to scale up… or watch on Vimeo here. So, here’s a bit of news. I just finished a second short film! This one is much, much shorter than Little Theatres, of course, and was done for a local art show, at Resistor Gallery. The film was conceived of and boarded, with its elements built, lit, and shot, its titles designed, sound recorded, and other fiddly post work fiddled with… ALL over the course of a week and a half. But I wanted to show finished animation here on this blog! Isn’t it exciting! Finally, there is an animated, non work-in-progress piece that I can show. I also wanted to write a post of my process — how did I actually complete an entire (though short!) 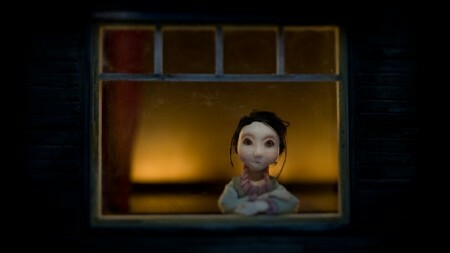 stop motion film in 9 days? HOW? That’s crazy! 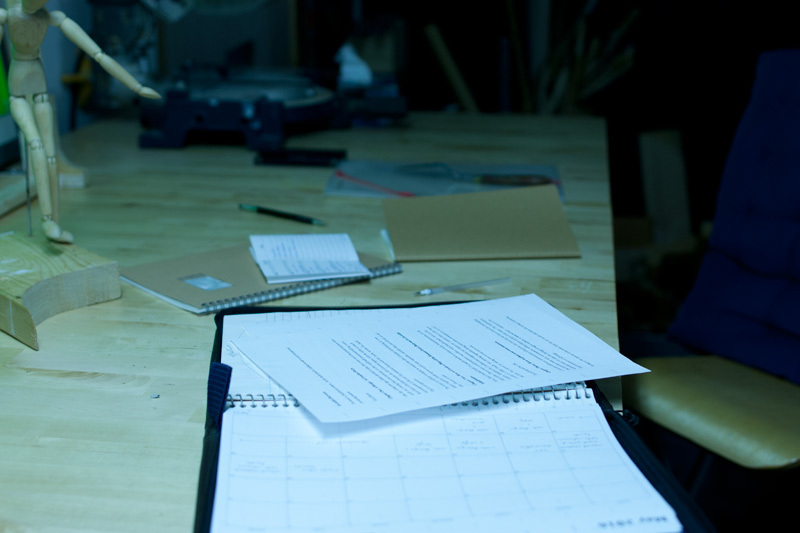 Here’s where I usually get bogged down, overthinking things and planning and replanning and spinning my wheels. Because there was so little time, I had to come up with an idea fairly quickly, and not think about it too much. So I drew inspiration almost instantly by doing the things I normally do… poking around various design / art blogs, and looking at stuff around the house. 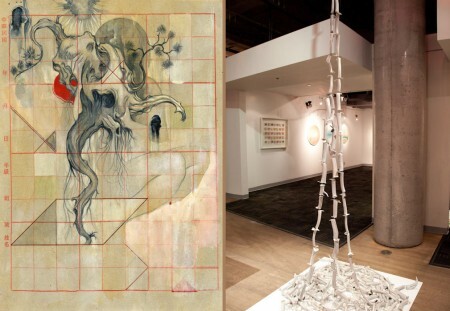 On the left is a painting called Grammar Two, by James Jean. One of my favourite artists… and I have always loved this painting. It gave me the idea to have the little girl (Abigail) pull the Krampus bits out of a gridded box. The image on the right is from a great little blog created by local shop owners, who feature works by (mostly Scandinavian) artists and craftspeople — Kitka Design Toronto. The pic is from this post, and I knew right away when I saw it that I needed to string together Krampus bones (or is it the bones of little children…? Mwahahahaha) and drag the Krampus fur along the floor with them. I am not really a storyboard artist AT ALL. Luckily I do not have to sell the story to a client in this case — I’m just trying to clarify ideas for myself, and nobody else. So I try to break the film down shot by shot, and clarify the framing, as well as the action in each shot. So this gets the story going, and the basic framing decided, and the general actions of each scene. I figured here that there would be 4 shots, which I basically stuck to, more or less. I crossed out the third frame due to time restrictions — how am I going to make the puppet walk across the room, when she isn’t rigged for walking? Nixed. Also in what became the third shot, I decided against the disembodied hands reaching through the wall, and instead had Krampus jump through the wall on his own, dragging his bones rather than having the bones pull him. I based the final scene on a painting I once started, a few years ago, and never finished, of a fur coat hanging on a tree in the middle of an empty landscape… It was nice to be able to recreate this image for something else! And to finish it! 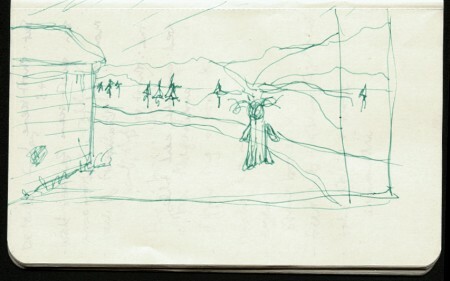 But in the “boards” above I had described this tree as spinning on a platform — again, this idea was cut out, due to time restraints. Also, I did not end up making Krampus mucky and gross… probably due to keeping it simple, and being constrained by time, again. 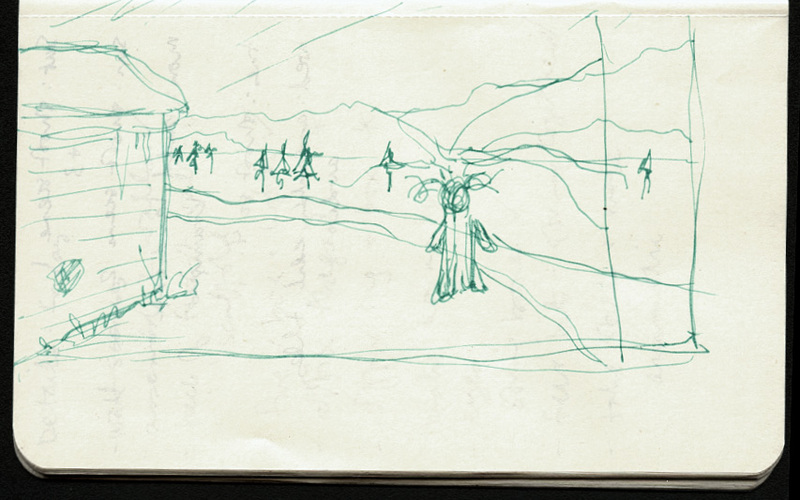 Here’s a sketch where I refined the composition a little, for the final scene. 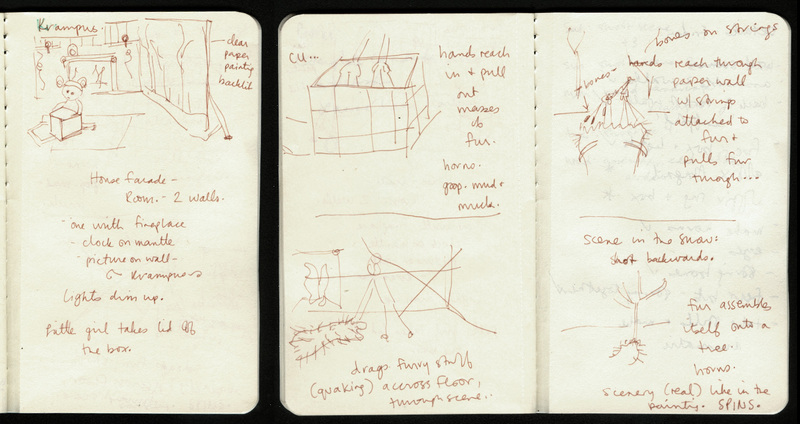 I carry this little notebook with me, and sketched this up on a crowded subway one morning. The wheels were churning constantly… I have to be ready to draw things out, so I like carrying around a little book like this. Especially when I’m stressed — keeping lists and notes and drawings really helps me organize my thoughts and calm down a little. Once I had the scenes clarified, I picked up some materials for building the sets, props, and Krampus puppet: some clear and ivory fimo for the bones, some fake fur for the creature, and some fabrics for the carpet and wallpaper. I spent long hours these two days building all the elements I’d need to shoot the first three scenes. I figured I’d build the landscape set for the final shot after I shoot the scenes, just in case I was to run out of time, or in case the story changed somehow at the last minute. Basically just wanted to get the first three scenes completely out of the way before tackling a landscape build. This was by far the most stressful day of the whole process. I had never built a landscape set before. I decided early on that the key would be to construct it under camera… Meaning, I set the camera up FIRST, then added pieces, one at a time. I’m really fussy about composition, and for some reason landscapes seem really particular, in terms of balancing out the sky vs. the ground, and having the tree branches fall at the right angle, etc. So the only way to really preview this was to set up the camera, and build while viewing the scene through that framing. I think it turned out OK, but would have LOVED to have had more time to finesse it. I think the mountains are lame (they are flat cardboard cutouts), I could have done a MUCH better job on the sky painting, and the trees are not that great, but hey… I built it in ONE DAY! Though I have never built a landscape, I really admire landscape miniature artwork. There are two such artists that I know of and admire — actually one who I just found out about today (thanks Rob P!) 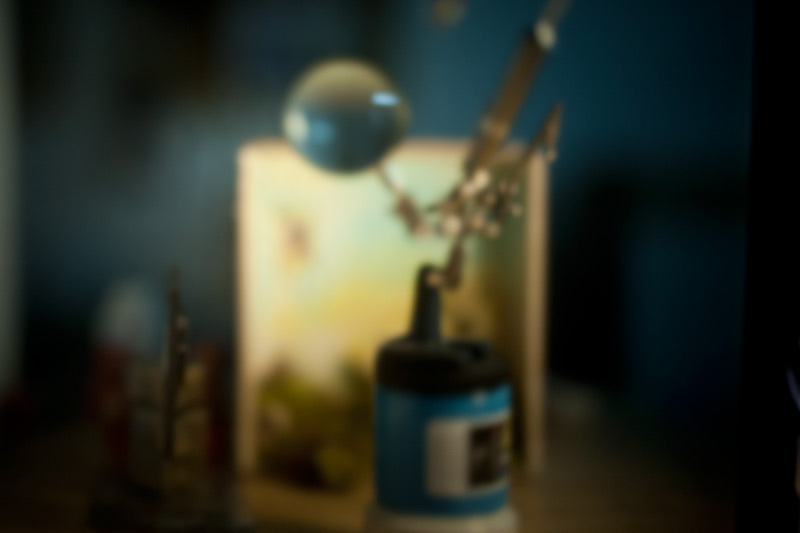 — Adam Makarenko, a fellow Torontonian, and Kim Keever. My landscape above is embarrassing by comparison, but I will get there one day… in my own time.) ONE DAY! I knew this scene would be easiest shot backwards, so that’s what I did. It went totally smoothly… I propped the Krampus figure up onto the tree, then just touched his fur, frame by frame, to randomize it as if it was blowing in the wind… then gradually slinked him down the tree. In reverse, it looks OK. I always find it tricky shooting in reverse, as I can’t preview what it will actually look like when played the right way around. But it turned out OK, and in this case it doesn’t matter because it is played both ways anyway. I recorded the sound using my new obsession gadget, the iPad. I didn’t even know it had a mic in it, but oh yes! It does. So of course it’s a mono recording, and if you listen closely in a fancy surround-sound setup it’s probably pretty bad, but hey, I had a few hours to select and edit the music! It was the best I could do. In the end, Hungarian Melody was the right tune for this project. For sound design, which I kept extremely simple, I decided on the fire and wind sounds, finding free downloads online. Then, titles… used my current favourite fonts and their embellishments… Added a vignetting and some flicker in AE. So that’s pretty much it… the other post work was boring, just editing out lights, adding fog, adding a BIT more colour to the sky (cheat! cheat!) and that sorta thing. Darkening some areas, lightening others. Time remapping a bit here and there. Hope you enjoyed this runthrough of how to make a film in 9 days! Which I do not recommend doing, by the way. But, it can be done. Krampusnacht is this Sunday… have a very merry Krampusweekend! This entry was posted in Uncategorized on December 3, 2010 by stephanie dudley. Last week I was in Montreal, recording the music for the film at a groovy little recording studio called Hotel 2 Tango. Somehow I forgot to take pictures, so I will just have to describe it! 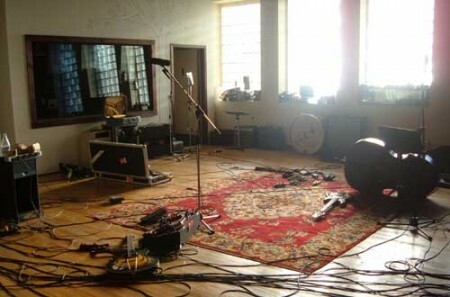 The studio itself is mainly an indie-rock recording studio, so this project was a little different for them. We rented a grand piano, set up a projector so that the musicians could see the film up on the wall, and Graham Lessard, the recording engineer, scattered mics and chairs throughout the room. When the musicians (Ensemble Qat) arrived, they spent an hour or so warming up, while Graham tweaked his set-up. This was one of my favourite parts of the day — the musicians just have such a great rapport, and clearly know how to have fun. The warm-up sounded like eddies forming and disappearing in water… the musicians would play separately, then join their sounds into a formation, then separate again. Sometimes it would get silly, with plucks on piano strings, or jabbing the violin and cello with the back of the bows, or a clarinet being taken apart and its smallest part played like a kazoo… Sometimes the music would be extremely loud, sometimes soft… But the playfulness and friendly energy carried throughout. Then, once Graham was satisfied with the way the sounds were coming through his deck, we did a quick run-through, and Qat improvised as the video played onscreen, and on the wall. We may have done two run- throughs like this, and then the musicians came into the recording booth to hear what they had done, and so that we could chat about it. This is where the choices made in improv get interesting. I had discussed with the band a week prior to the recording whether or not they wanted to see the film before our recording session. Since the music is improv, I wasn’t sure if they wanted to see it and think about it, or, as the pianist (my cousin Sonia) had suggested, just wing it on the day of the recording. Improv works best when there is a freshness to the sound, she said, and if the music is planned too much, or repeated too often, then it loses this freshness. But then they later decided to see the film a couple days in advance, and they asked me for some notes, describing the mood of the film, and moments that needed any kind of musical emphasis. So I sent them a link to the rough cut along with a couple pages of notes, where I tried my best to describe the film’s various moods and emphatic moments. With our first ‘take’ of the recording, this quick run- through, it seemed like my notes were interfering — the band was looking for these moments to hit, and it was sounding a little choppy. Compared to their warmup, which seemed to flow and ebb so beautifully, the first couple run-throughs sounded forced and tense, and didn’t quite strike the right mood. So now, we decided the best approach would be for them to focus on creating a mood for each section, rather than hitting the individual moments of action. This method definitely worked best — the following few takes turned out brilliantly. We then chatted a bit more about the moods of the film. There are 3 distinct sections to it, and each one has a very different feel. The first two sections were easy for me to describe, and perhaps easy to interpret visually, in terms of mood, but the last section was tricky. What is the poem about here, what mood do we want to create with the music? My direction was a little unclear. I knew how it should resolve in the last few seconds, but there were a few empty parts where we just left things open. In 4 takes, they were done. In the very first take after our ‘run- throughs,’ the band hit the first section perfectly. I knew instantly that this take was going to work best for the visuals. They continued on, without breaking to listen, and in take 2 they nailed the middle section of the film. Then in the third take, I wasn’t sure… they did one more take, which I still wasn’t initially sure about, but in the end, we used this take for section three. I think because I wasn’t 100% clear on what that section should sound like, it was more difficult to say “YES! I love it” when I first heard it. But it grew on me, and by then the band had exhausted that direction, anyway. So that was that, it worked! I think by the end we were all totally happy with how the sounds worked with the visuals. The band then took a break for an hour, while Erín Moure came in to record her voice for the VO. Graham set up a mic for her in the main room, where the band had played. She was standing in the middle of the room, looking out onto the wall that had the film projection. But as Graham started to record, he wasn’t happy with the sound… because Erín was standing in a large room, her voice was echoing and sounding distant, as if she was performing in a concert hall. For a VO the voice should have more intimacy, Graham said, and feel more immediate. So he set up the mic in the a booth beside the ‘control room,’ and all was well. Erín read the poem twice, while watching the film, so that she could get the right intonation for the lines of her reading. Her voice happens to suit the visuals so well — she has a fairly dark- sounding voice, and added even more drama to the image… So everything just seemed to fall into place! After about an hour, just as we were wrapping up with Erín’s recording, Sheila, the band’s cellist, called to see how things were going, and if we were ready for them to come back. Yes, it’s perfect timing! So they came on back to the studio, and set themselves up to record the closing credit music. So we went through about 6 or 7 takes of the 1.5 minutes or so of music for the close, until the band was happy with it. The end result is so beautiful, I have actually cried a little while listening to it… I have since listened and watched the film over and over again… it’s tough to stop! I love the music so much. The violin is especially beautiful, I find, though of course I was so impressed with *all* of the musicians of the band… They did such a fantastic job — they are utter *naturals* at putting music to visuals. Thanks, Ensemble Qat, for your music-making-magic! And thanks to Erín for her unique voice, and of course, for the beautiful poem! This entry was posted in Audio on September 20, 2010 by stephanie dudley.